Here's a one-sentence headline-style synopsis for Bart Layton's American Animals: Rookies in Over Their Heads in Art Heist. But there's a bit more to writer-director Layton's clever, stylish true-crime yarn about four lads and their grandiose idea to steal a priceless collection of art prints and rare books from a university library—with no previous experience at that kind of work. Layton's ostensibly playful pic, based on an actual 2004 walk-right-in, walk-right-out-with-the-loot daylight robbery, could conceivably fit into the same teenage-prankster-popcorn groove as Ferris Bueller's Day Off, if we were to swap out upper-middle-class schoolboys in the Chicago suburbs in favor of a quartet of goofball college students from Kentucky. Irish actor Barry Keoghan (Dunkirk) portrays Spencer Reinhard, a callow suburban youth who idealizes great artists but can't quite do it himself. On the freshman campus tour, Spencer notices that John James Audubon's magnificent series of nature prints, The Birds of America, along with a trove of other antique volumes, is under very light guard in the special collections library of Transylvania University in Lexington, Kentucky, where he is a student. Stealing them seems like a great way to raise some money. Spencer is a pudgy nerd unaccustomed to strong-arm theft, so he enlists his friend Warren Lipka (Evan Peters), a hell-raising non-conformist, to help plan and carry out the daring plunder. All they have to do is overpower the librarian, Betty Jean Gooch (Ann Dowd). British filmmaker Layton (The Imposter) has the happy idea to have the real-life Spencer and Warren appear and interact onscreen alongside the actors portraying them—and does the same with their two accomplices, Chas Allen and Eric Borsuk (played by Blake Jenner and Jared Abrahamson). It's a thought-provoking touch. We can plainly see that the heist is doomed to failure, so letting the real-life thieves—all of whom served prison time for the crime—comment on their own foolish thought processes puts a spin on what might otherwise have been just another slapstick youth-market romp. Left to their own devices, Spencer, Warren, Chas, and Eric couldn't pull off a wet sweater. Virtually everything they do is wrong, from Warren's trip to Amsterdam to meet with a fence (Euro utility player Udo Kier) to the four boys' "old man" disguises to a misguided search for an art appraiser. 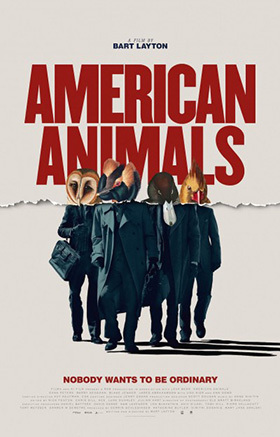 American Animals (interesting title) comes dangerously close to being a one-joke comedy. The klutzy, inept moments are tailor-made for a trailer reel, but putting the actual culprits in the same frame as the actors drives home how serious this crime business really is. The middle-class kids chose the wrong prank. A seven-year sentence is a dandy proscenium breaker. Real-life librarian BJ Gooch puts it in her own perspective as she discusses her "transformative experience" near the end of the film. "Makes me wonder if they really knew why they did it," she muses. And we, the audience, get to vicariously experience an entertaining cautionary tale. Kids, don't try this at home.